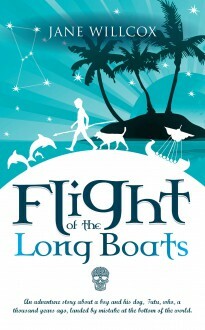 Flight of the Longboats is an adventure story about a boy and his dog, Tutu, who, a thousand years ago, landed by mistake at the bottom of the world. Kahu is the son of the Chief of a peaceful tribe living on a small tropical island in the middle of the world. Their safety has been threatened by distant, marauding savages. Navigating by the stars, the Chief and crew sail away across the oceans to search for a safe place for the tribe to live. Guided by a friendly dolphin, they discover a fabulous Wonderland—a magic land of plenty. And best of all, NOBODY lives there. It is theirs for the taking but there isn’t time to prepare a proper migration. Evidence of the dreaded cannibal warriors preparing to attack has been discovered. They must flee!